Before this release our system behaved as if the QUANTITY of a product is zero(0) , Magento sets the product to "Out Of Stock" regardless if you enabled back orders in Magento. We have released a new feature to leave products "In Stock" in Magento even if their QUANTITY is zero(0). Please note: By default we have enabled this feature on ALL current users and new users that sign up. So it wont have any affect on your current setup. Please also note that you must have "Back orders" enabled in order for this feature to work. See below on how to enable back orders in Magento. 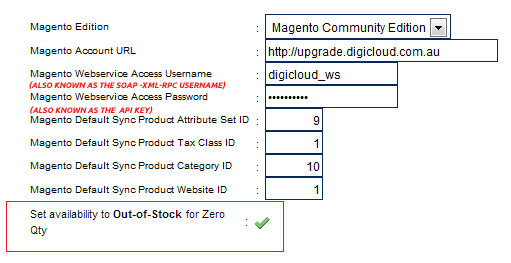 And the New Feature (Set availability to Out-of-stock for Zero Qty) is set to "Disabled"
Then the result if product QTY of stock is 0: Magento will display "In Stock" online. And the New Feature (Set availability to Out-of-stock for Zero Qty) is set to "Enabled"
Then the result if product QTY of stock is 0: Magento will display "Out Of Stock" and not display online.